203 mm/55 Mk163 х 3 pcs. 127 mm/38 Mk326 х 2 pcs. 76.2 mm/50 Mk3310 х 2 pcs. 76.2 mm/50 Mk332 х 2 pcs. Des Moines — American Tier X cruiser. One of the best heavy cruisers in the world. The ship was designed using the experience gained in World War II, resulting in excellent protection and very powerful AA armament. The key distinctive feature of cruisers of this type was auto-loading main guns that had a very high rate of fire. Only a handful of high tier cruisers are known to have absurd firing rates: Neptune, Minotaur, Worcester, and this heavy cruiser. It is no surprise that due to her being the last all-gun cruiser made, she has all the lessons learned from her cruiser predecessors in the Second World War incorporated in her design. A very noticeable trait on Des Moines is her absurd rate of fire for a heavy cruiser, with each turret reloading at 5.5 seconds, making her extremely deadly to destroyers within radar range and other cruisers. She also can whittle down battleships quickly and, with her impressive AA suite, wipe out carrier strike squadrons with ease. However, she is extremely fragile: her thin armor makes her susceptible to penetration from most Tier IX and Tier X battleships at all ranges. While Des Moines has impressive firepower and AA, her maneuverability is mediocre and her armor is terrible. With a standard cruiser speed of 33 kts and fast base rudder shift time of 8.6 seconds, Des Moines can evade incoming shells and torpedoes relatively well. However, while she can turn well, the speed loss on turning is massive enough to make her an easy target for any other ship with their guns loaded and ready. Additionally, with her 27mm armor belt (as opposed to Zao and Hindenburg’s 30mm or Moskva’s 50mm) this makes her very susceptible to most battleship AP shells at most ranges. Additionally, because of how flat her bow is designed in comparison to the other Tier X heavy cruisers, this makes her extremely susceptible to enemy battleship AP shells being able to penetrate her citadel through her bow. In contrast to her weak points, the Des Moines high shell arc and gun layout gives her a unique advantage that her cruiser colleagues at her tier lack and as such she is capable of weighing anchor behind an island and lob shells over the island at distant targets with relative safety. Should the island be too tall, one can also park the ship around the corner of an island while bow on to act as a deterrent to advancing enemy ships, while presenting a relatively small profile. Exploiting this technique allows one to turn a disadvantage into an advantage. Additionally, firing AP shells at bigger targets such as battleships can deal a surprising amount of damage in such a short time. However, it is recommended to do so only when she is close enough to have the rounds deal maximum penetration or if the target is broadside. Furthermore, given her rate of fire and decent fire chance, this makes Des Moines a deadly flamethrower to battleships within reach. Overall, unlike most other Tier X cruisers, Des Moines cannot fight as effectively on open water due to her thin armor, slow shell velocity, and speed loss when turning. If the player has mounted the Legendary Upgrade, then Des Moines can become a very agile ship that will prove extremely difficult to hit, provided the player can use their speed and rudder accordingly. But should they play without said upgrade, then a more safe approach for each game would be to play defensively during the initial stages of the game, while becoming more aggressive slowly towards the end. But in general, how aggressive the player should be depends upon the flow of the battle. Fast reload - fastest out of all heavy cruisers of Tier X, which also makes up for relatively low fire chance. Great shell penetration - can basically fire her AP shells at any (broadside) ship with great efficiency. Good AP shell angles - the higher autobounce angles for the AP shells means they can easily pen at angles where other cruiser's AP shells will bounce, making for a devastating combination with the high shell penetration. Powerful anti-aircraft armament - rivaled only by Hindenburg, Minotaur, and Worcester, Des Moines can easily shoot down any carrier strike aircraft without Defensive AA Fire ( ). High shell arc - allows firing from behind island cover and consistent citadel hits on other cruisers from long range due to plunging fire. Medium ranged and long-lasting Surveillance Radar ( ). Easily damaged by HE shells. Low main battery survivability - easily incapacitated / destroyed by other 203mm AP shells after sufficient time. Slow shell velocity and high arc - enemies have time to maneuver and evade the shells. High citadel - plunging fire from other ships will easily penetrate the citadel. Poorly armoured - Almost all battleships will be able to overmatch the plating, and, in conjunction with the high citadel, deal devastating damage. Anti-aircraft armament very easily destroyed - can quickly be rendered useless against aerial attacks. Des Moines has no modules to research. Slot 1: Main Armaments Modification 1 ( ) keeps the guns active and firing. Slot 2: Damage Control System Modification 1 ( ) lessen the fire damage taken, or Surveillance Radar Modification 1 ( ) if it is available. Slot 5: Concealment System Modification 1 ( ) stay concealed. Anti-air Build: Captains wishing to focus the role of Des Moines on air defense will opt for Auxiliary Armaments Modification 1 ( ) for Slot 1 to increase anti-aircraft armament durability, AA Guns Modification 1 ( ) for Slot 3 to increase her medium- and long-range AA power, and AA Guns Modification 2 ( ) for Slot 6 to increase her overall AA power. If rather than maximum AA defense a more balanced build is desired, consider replacing AA Guns Modification 2 with Gun Fire Control System Modification 2 ( ) for range or Main Battery Modification 3 ( ) for faster reload. Gun Build: Captains focusing on making Des Moines have better main batteries will opt for Main Armaments Modification 1 ( ) for Slot 1, Aiming Systems Modification 1 ( ) for the Slot 3 to increase her accuracy, and Main Battery Modification 3 for the Slot 6 to shorten her reload down to 4.8s or even lower with Adrenaline Rush skill. Gun Fire Control System Modification 2 for the Slot 6 is also useful, as it increase her range up to 18.4km, on par withMoskva’s and Hindenburg’s. Again, this depends on captain's choice whether better reload or better range is what he pursue. This build also removes her AA usefulness, although her AA is still powerful even when not focused on AA. Des Moines also has access to chain of missions that will grant a Unique Upgrade: Enhanced Propulsion ( ) for Slot 6, which decreases her rudder shift and also halves the time taken to accelerate to full power, while shortening her Surveillance Radar ( ) duration by 10%. With this upgrade and Propulsion Modification 2 ( ), Des Moines can accelerate from 0-27kts in about 8 seconds. It is also recommended to equip Surveillance Radar Modification 1 ( ) in Slot 2 to negate the negative effects of the Unique Upgrade. Captain focusing Des Moines on AA build will equip Defensive AA Fire II ( ) for the Slot 2, especially when in a division with a carrier. Although for solo playing, Hydroacoustic Search II ( ) is more recommended if there is no carrier around. Des Moines captains should use Surveillance Radar II ( ) on Slot 3 to increase their in-game impact (hunting the extremely stealthy destroyers of Tier X), as Catapult Fighter ( ) and Spotting Aircraft ( ) are not at all useful in hunting stealthy or smoke-covered enemy ships. Type 1, 2, or 5 camouflage can be equipped for Credits ; Types 1 or 5 are recommended at a minimum to reduce detection range. 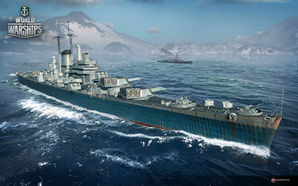 Players who wish to spend doubloons can equip Des Moines with Type 20 camouflage that lowers her detection range, reduces the accuracy of incoming shells, reduces her repair costs, increases her credit earnings, and increases the amount of experience she earns. Des Moines was launched 27 September 1946 by Bethlehem Steel Company, Fore River Shipyard, Quincy, Massachusetts; sponsored by Mrs. E. T. Meredith, Jr.; and commissioned 16 November 1948, Captain A. D. Chandler in command. She became the first of her class to mount the semi-automatic Mark 16 8 inch turrets and carry the new Sikorsky HO3S-1 utility helicopters in place of seaplanes. It was named after the capital of the state of Iowa. In a varied operating schedule designed to maintain the readiness of the Navy to meet the constant demands of defense and foreign policy, Des Moines cruised from her home port at Newport, Rhode Island and after 1950, from Norfolk, Virginia on exercises of every type in the Caribbean, along the East Coast, in the Mediterranean Sea, and in North Atlantic waters. Annually between 1949 and 1957 she deployed to the Mediterranean, during the first seven years serving as flagship for the 6th Task Fleet (known as the 6th Fleet from 1950). In 1952, and each year from 1954 to 1957, she carried midshipmen for summer training cruises, crossing to Northern European ports on the first four cruises. She also sailed to Northern Europe on NATO exercises in 1952, 1953, and 1955. On 18 February 1958, she cleared Norfolk for the Mediterranean once more, this time to remain as flagship for the 6th Fleet until July 1961 when was placed out of commission in reserve. Through her Mediterranean services Des Moines contributed significantly to the success of the 6th Fleet in representing American power and interests in the countries of Southern Europe, Northern Africa, and the Near East. She made this contribution through such activities as her participation in NATO Mediterranean exercises; her call to seldom-visited Rijeka, Yugoslavia, in December 1950 and Dubrovnik, Yugoslavia, in May 1960, and to many other ports as a regular feature of her schedule; her cruising in the eastern Atlantic during the wake of the Suez Crisis of 1956; and service on patrol and as control center for American forces in the Lebanon crisis of 1958. Film footage of her cruising with other ships of the United States 6th Fleet was used in the introduction and conclusion of the movie: "John Paul Jones" starring Robert Stack (Warner Brothers-1959). After decommissioning in 1961 she was mothballed in the South Boston Naval Annex and eventually laid up in the Naval Inactive Ship Maintenance Facility at Philadelphia in maintained reserve. In 1981 the United States Congress directed that the Navy conduct a survey to determine if she and sister ship USS Salem (CA-139) could be reactivated (in lieu of two Iowa-classs battleships) to support the 600-ship Navy proposed by the Reagan Administration. The study concluded that while both ships would be useful in the active fleet, there was not enough deck space to add the modern weapons fit (Tomahawk cruise missiles, Harpoon anti-ship missiles, Phalanx CIWS mounts, radars and communication systems) that the ships would need to operate in a 1980's environment. In addition, the per-ship costs for the reactivations and updates (that were determined feasible) would be close to the costs for an Iowa, for a much less capable ship. Therefore, both ships remained in maintained reserve until they were struck off the reserve list in August 1993. After an attempt to turn her into a museum ship in Milwaukee, Wisconsin, failed — Salem did become a museum ship , however — she was sold in 2005, and then towed to Brownsville, Texas, for scrapping. By July 2007, she had been completely broken up. Her status officially changed to "disposed of by scrapping, dismantling" on 16 August 2007. Two of her dual 5"/38 gun mounts were donated to the USS Lexington (CV-16) museum in Corpus Christi, TX, where they can now be seen on display. Her sister ship USS Newport News (CA-148) was scrapped in New Orleans in 1993. The third Des Moines-class ship, the USS Salem (CA-139), is a museum ship in Quincy, Massachusetts. Des Moines was never camouflaged as it was commissioned after World War II. After the war the navy adopted the peacetime color of Light Gray overall. Permanent camouflage resembles the Measure 31/16d scheme, which is actually the historical camouflage of the Baltimore-class heavy cruiser. This page was last modified on 19 February 2019, at 04:51. This page has been accessed 155,187 times.